For a quarter century, the 57 hectares of wide-open verdant terrain inhabited by the Meadowbrook Golf Course have been eyed by eager developers. Residential projects of anywhere from 1,500 to 3,000 units have been proposed for the property straddling Côte-St-Luc and Lachine. For just as long, a dedicated group of conservationists known as Les Amis de Meadowbrook and their supporters have battled to preserve one of the area’s few remaining large green spaces. Ultimately, they would like to see the course transformed into a public park. The conservationists appear to have scored another victory. In the land use and development plan for the island of Montreal, which spells out the development vision for the city and its adjoining municipalities, and is expected to be adopted Wednesday by the city’s executive committee, administrators have changed their initial designation of the Meadowbrook site from “residential” on the Lachine side to “large green space or recreational.” Côte-St-Luc changed its zoning on its side to recreational in 2000. The Montreal urban agglomeration land use and development plan in turn influences the city of Montreal’s urban plan and that of its 19 boroughs, including Lachine. The Meadowbrook file generated the largest number of briefs presented in the fall to the committee taking recommendations on the land use plan, said committee member Éric Alan Caldwell. His Projet Montréal municipal party made the same recommendation, and the committee voted unanimously that the Meadowbrook site be zoned green. Once the zoning has switched to green, a developer would have to convince city councillors to change it back to residential in order to start a project, a process that would be “difficult,” Caldwell said. Groupe Pacific purchased the property in 2006 for $3 million and has been lobbying to build on the Lachine site. As late as February 2013 it submitted a request to build as many as 1,500 housing units. Montreal city council rejected the bid, saying it was not interested in covering the costs for a new road, bridge and water and sewage pipes into the development. Media reports have pegged those costs at $160 million. Groupe Pacific launched a $44-million lawsuit against the city last February, claiming damages for not being allowed to begin construction. Côte-St-Luc was hit with a $20-million lawsuit in 2000 by the previous owners of the land, Marathon Realty, the real-estate arm of Canadian Pacific, after it changed its zoning for the site. The case is still before courts. Groupe Pacific did not respond to requests for interviews Tuesday. Caldwell said he could not comment on the legality of a municipality switching zoning designations after a developer has bought a property zoned residential because the cases are still before the courts. There is nothing in the new zoning that would force Meadowbrook to become a public park, Caldwell said. It can remain a golf course. The more than 25-year saga of the attempted development of the Meadowbrook Golf Course took a new twist as it was revealed that a subsidiary of its latest owner, Groupe Pacific launched a $44 million lawsuit against the City of Montreal. The city has twice rejected the developer’s plans for housing on the site, saying the infrastructure needed would be too costly. Groupe Pacific’s Suzanne Deschamps was not available for comment at press time. In the early 1990s, other attempts were made to develop the site, but plans were shelved after much protest against development. In subsequent years, Côte St. Luc rezoned its side of the site recreational. The other side is primarily in Lachine. Campbell Stuart, former Montreal West mayor and now spokesman for Les Amis de Meadowbrook, says the lawsuit involves transferring the Lachine part of the site to Montreal in exchange for $44 million, which would include more than $850,000 in damages. Groupe Pacific had launched a lawsuit against Côte St. Luc for $20 million when the city rezoned the site. In a previous interview, Deschamps denied she breached any codes or laws regarding lobbying. Stuart also pointed to last year’s rail disaster in Lac Mégantic. One reason cited by activists not to develop the site is its close proximity to rail lines. “The city mandated its urban planning department to, in unanimous resolutions of the agglomeration and city councils, put in its urban plan the 300-metre safety setbacks, which means it can’t be built on. But it could never be built on. As well, Les Amis de Meadowbrook provided a 2012 letter from CP’s Breanne Feigel to Côte St. Luc councillor Dida Berku, saying the feasibility of a residential project on the site, in light of the proximity to rail lines, is “not compatible with our operations in the area…. CP does not support the location of any residential development directly adjacent to active rail corridors and yards. The landowners of Meadowbrook Golf Course continue on the futile path of a residential development adjacent to a major rail yard and commuter rail lines notwithstanding the horrific lessons learned by last year’s Lac Megantic disaster. The railway association reported almost twenty years ago that any such development would require explosion-proof glass and special ventilation systems. 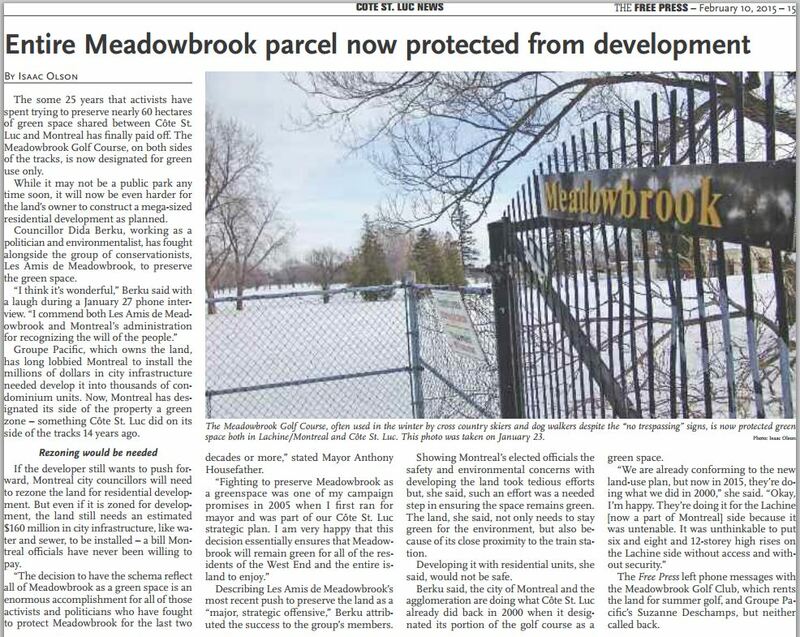 Developing Meadowbrook as a residential development is contrary to the founding principles of this land acquisition, originally purchased by the railway for recreation and leisure by its employees long before Cote Saint-Luc homes mushroomed in the late 50s and 60s. And with the influx of tens of thousands of West End residents through the decades the need for green space for recreation, sport and leisure has only become more obvious, not to mention the need for this land mass for air purification and filtration, for separation of the polluting smokestacks of Lachine industry down the bluff, for safe distance between rail lines and houses, for cooling the West End from Urban Heat Islands and more. The City of Montreal shouldn’t budge from its position of refusing the development proposal, just as Cote Saint-Luc has done for many years now. Please search “Meadowbrook’ on this blog for the complete history on this important issue. In a unanimous resolution the City Council of Cote Saint-Luc tonight adopted a resolution, together with its suburban partners, calling for the Montreal Agglomeration to include $44 Million in its 2014 capital expenditure budget toward Phase 1 of the Cavendish-Royalmount-Cavendish link. The resolution falls in line with Montreal Mayor Denis Coderre’s election promises (and we thank Mayor Coderre immensely for this position) to see the completion of this much-needed link between Cote Saint-Luc, Montreal, TMR and St. Laurent. The resolution calls for the “optimal scenario” also known as the Cote Saint-Luc scenario, being an indirect link between the two dead ends of Cavendish, meaning rather than a straight line the link would connect to the new Hippodrome development in the Snowdon district as well as to the TMR scientific park. The extension project has never been closer to reality despite 50 years of discussions. The responsibility to finally get the shovel in the ground lies with the City of Montreal acting on behalf of the Montreal Island Agglomeration. This is good news for local commuters who need more efficient access to the West Island, the airport and to points north and north-east. Even motorists who use Fleet Road will benefit by reducing the daily gridlock through Hampstead, further complicated by that town’s confusing left turn restrictions off of Fleet Road. With the demolition of the Turcot interchange scheduled in the coming years we can expect a decade of traffic congestion across the West End and southern portion of Montreal. Cote Saint-Lucers and neighbouring residents will greatly benefit by quickly connecting toward the north and west, to Autoroutes 15, 13 and 40 and to Decarie. The route should also open up faster routes to the Metro system. City council: New rules would prevent construction near tracks, railway yards. (Montreal Gazette) Link removed. Montreal has adopted new rules that would forbid the construction of new buildings within 30 metres of busy train tracks and 300 metres of a railway yard. The new rules would also outline steps that could be taken to improve safety and reduce nuisances like noise and vibrations from rail operations, such as installing safety fences, berms and noise barriers. Montreal city council voted unanimously Tuesday to adopt the new guidelines, drawn up by the Federation of Canadian Municipalities and the Railway Association of Canada. They would be included in Montreal’s new urban plan, which must be adopted by the end of 2014. Montreal’s agglomeration council is also expected to approve them Thursday, extending them across the island of Montreal. Côte-St-Luc city councillor Dida Berku has been calling for more than 20 years for municipalities to adopt railway setback guidelines for development and said she was “elated” when Montreal city council adopted them. The new guidelines could mean the controversial development of the west-end Meadowbrook golf course would not be allowed to proceed. The golf course, which is in Lachine and Côte-St-Luc, has a train yard on its north and west side, with train tracks running east-west through the golf course itself. Several housing developments have been proposed for the site over the past 25 years. Montreal has said building municipal infrastructure for the site is too costly. This is excellent news. I have supported this theory in order to safeguard residents living near rail lines and yards for 20 years and I’ve echoed Dida Berku’s call to protect Meadowbrook, in large part, because of this potential danger. It is sad that this position by the City of Montreal had to follow such a horrible tragedy but Lac Megantic has served as a wake up call for municipalities across Canada. Cote Saint-Luc has been very progressive in assuring Meadowbrook’s future as a green space. This resolution, soon to be presented to the Montreal Agglomeration Council will give greater assurance on its ultimate preservation.